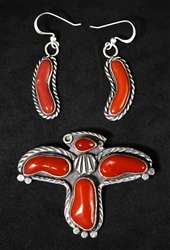 This beautiful coral pin and matching earrings are set with 6 gorgeous hand cut, large Mediterranean Coral cabochons. The silver bird design with stamped wire and perfectly placed stamped silver raindrops add the final touches to this gorgeous set. 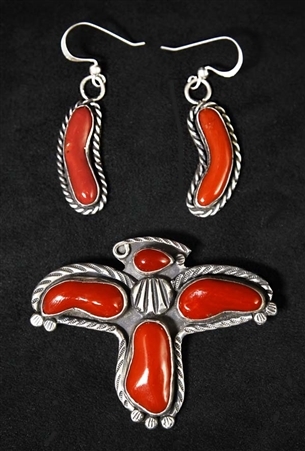 Not hallmarked, but the workmanship is that of a seasoned artist. The pin measures 2 1/8" by 1 7/8" . The earrings measure 1 1/4" long by 3/4"wide, with silver french wires. A pin to pendant conversion pin is available upon request.